Artificial Intelligence is one of the most trending topics in Financial and Insurance industries today. The concept of artificial intelligence expands various adaptations utilised in very different ways. In the insurance industry for example, chatbots are one major way AI has been utilised to aid in customer service. Several chatbot vendors with insurance specific programming exist in the marketplace today, offering various tools that can help aid in marketing and sales growth. 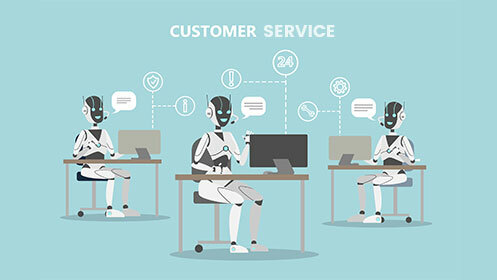 Customer experience, on the whole, has seen a significant opportunity to improve upon marketing and insurance sales through the involvement of chatbots. Though chatbots aren’t exactly new to the financial industry—they have the potential to be used as support for customer service staff and sales initiatives, by saving human resource and time. Insurtech thought leader, author, and speaker, Marty Agather—shares a discussion around chatbots and the current ways in which the insurance market is using them. We’re living in an age where reality has begun to reflect fantasy. Though AI isn’t entirely on the spectrum of ‘Back to the Future’ in scientific achievements—technology developments growing at such a rapid pace have created intelligent systems to learn from our behaviors and data more than ever before! Chatbots are the insurance sectors way of finding meaningful use cases for bringing artificial intelligence into the mix. The first ever computer capable of communicating with humans was in 1966 at the Massachusetts Institute of Technology (MIT), in the Artificial Language Lab. Using pattern matching software, this intelligent machine was able to communicate scripted responses. The utility is a critical value of importance driven by the significant advancements in computer and human interactions. A major driver of this adoption globally is the use of texting. Smartphones have become so widely popularised because text messaging has changed traditional conversations into ones with shorter interactivity. Expectations around short conversations have bled into what people demand utility wise in every aspect of our lives. Think about it. You’ve likely done some online shopping, whether retail or ordering groceries online, where you had to resort to utilizing the click-to-chat feature to answer a question or solve a problem. A good question you might be asking by now is, how is this relevant to such a complex industry such as insurance? The short answer being, chatbots can provide relevant answers to almost any random inquiry from customers or prospective sales. Insurance industry CEO’s like Raution Jaiswal of InsuredMine, have the opinion that bots are more than just messaging tools, but also very useful in making decisions. By actively listening to social media channels, as an example, Jaiswal’s chatbot can sense critical signals that can predict insurance events. Thereby, triggering responses that approach insurance concerns with those who might need it. A real-time example of this would be if someone posted about a potential car purchase that would then warrant the chatbot to respond in conversation to suggest the appropriate auto premiums. Using sophisticated learning machines, companies are better able to offer accurate and relevant sales propositions to potential customers. As the landscape of chatbot evolves, there’s no end in sight for the growth that messaging has taken on. Experts estimate 60 billion messages are sent daily. Further estimated from Gartner, that by 2020–85% of customer interactions will be managed solely with AI chatbots. Leading insurance companies are already deploying sales and customer service chatbots into their businesses. Other industries are following suit, so the question remains, is your business joining the chatbot wagon?